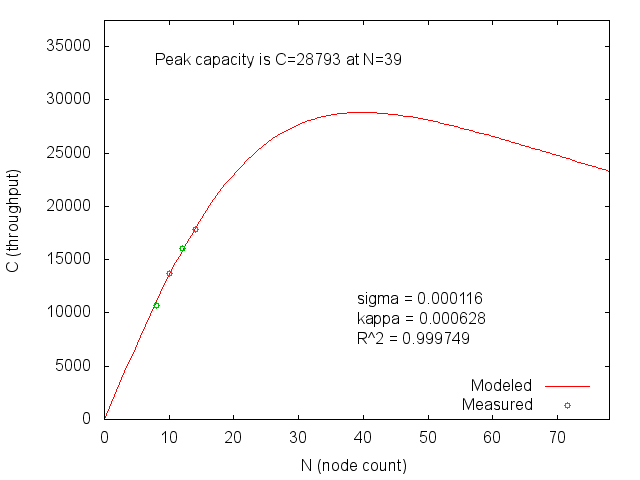 I’m reading a little bit about Riak, and was curious about performance and scalability. The only benchmark I found that allowed me to assess scalability was this one from Joyent. Of course, they say scalability is linear (everyone says that without knowing what it means) but the results are clearly not a straight line. So how scalable is it, really? The Universal Scalability Law is such a powerful tool for thinking about scalability. A few seconds later, I had my answer. Of course, this is to be taken with a spoonful of salt, because the modeling is based on only four measurements. But it’s an incredibly quick way to get an idea of what we’re looking at, just as a level-set.